BioWare's Greg Zeschuk says work on Star Wars: The Old Republic "will never end." Star Wars: The Old Republic is going gangbusters out of the gate, but where will it be a year from now? Two years? How about five? It's impossible to say, but BioWare has a plan - a few of them, in fact. "There are different levels of success and we have all the different models built out. While we want to be super-successful, we also need to plan for not hitting all our targets. Can we then still be profitable? Yes, but it will take longer," Creative Director Chris Ohlen told Gamasutra. "I can say that we have plans for super success in the millions of subscribers... and then we have plans for if we have a much smaller subscriber base," he continued. "While it would be great to get the kind of numbers that World of Warcraft gets, we don't have to come close to those in order to be wildly successful. We could be well below WoW and still be incredibly profitable." One thing he is sure about, however, is that BioWare isn't interested in jumping on the free-to-play bandwagon. It's tough to make a go of a subscription-based game because Blizzard so utterly dominates the sector but Ohlen said that The Old Republic is innovative enough to "change the way people view the AAA subscription MMO." And for now, the future looks bright enough that the entire existing Old Republic team at BioWare Austin will be kept together to continue working on the game. "Unlike a lot of other game companies that, once they launch a game, downsize their teams radically, our plan is to keep the team together and continue to focus on building content," he said. "We're very much focused on Star Wars, Star Wars, Star Wars for the foreseeable future." "It's hard to say right now what we may or may not do as far as future projects," added BioWare co-founder Greg Zeschuk. 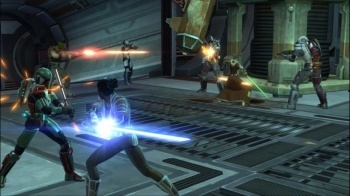 "We're really busy working on future SWTOR content as well as continuing to improve the service. This will never end."